Many folks don’t like visiting dental offices. This can be due to fear of pain, a dislike of the dental drill, or just plain not liking being told what to do or being judged by a dentist. As a result, some people allow years (or more!) to pass between visits to the dental clinic. While this is not uncommon, it is definitely not recommended! In fact, dentists normally suggest that you visit at least once every 6 months, and more if a need is detected. There are good reasons for this recommendation as well as dangers if you don’t follow it. Skipping dental visits can put you at risk of many dental problems and certain types of larger illnesses, including heart disease. This is only one reason visiting the dentist on a regular schedule is so important. 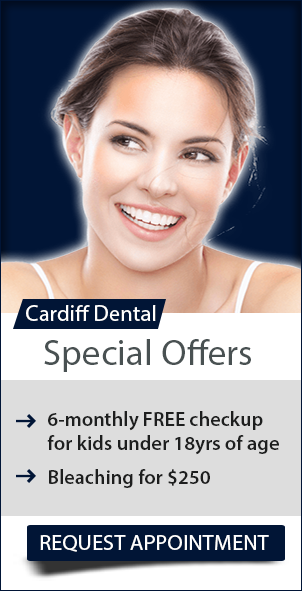 At Cardiff Dental, we can’t overstress the importance of regular dental visits! Dentists and dental professionals clean your teeth, work to keep your teeth and gums healthy, and check for conditions that may otherwise go unnoticed. Dental professionals make sure that your bones are strong, and will help you correct any habits that may be sabotaging your oral health. Skipping dental appointments may not seem like a big deal, but oral issues can develop and progress extremely quickly whether or not you notice them. By keeping on top of your dental cleanings and checkups you’re doing yourself a big favour in the long run. What do regular dental visits offer? When you visit your dentist for a routine checkup they carefully examine all parts of your mouth for signs of trouble. This means they will check your gums and teeth for signs of decay and disease. Your dentist may also examine other parts of your body, including your neck, your head, your face, your throat, your saliva, even the function of your jaw. These examinations allow the doctor to not only tell if you need dentistry work done, but also to identify signs of serious medical problems, including oral cancers, vitamin deficiencies, diabetes, or joint problems. Your mouth is the gateway to your body, and keeping it healthy is a great start on keeping your general health! Once a dentist has performed a detailed examination of your mouth, they perform a regular dental cleaning. The cleaning removes tartar or plaque that tend to build up on teeth. Soft plaque can lead to tooth decay and gum disease. It can also harden in place, becoming more difficult to remove and staining the teeth. Routine checkups are the best way to eliminate tartar and plaque and defend against tooth decay, cavities, and gum disease. Your teeth will also feel cleaner and look brighter once plaque and tartar are removed! Your dentist will also inspect previous dental work to ensure that everything is still in good order. For example, they may make sure that your fillings are still intact and that no decay has crept around or beneath them. Regular six month cleanings also help your dentist identify larger problems that need to be fixed. If they discover anything, such as cavities, root damage, or serious gum disease, they can then schedule an appointment to repair the damage. Some people who have full dentures or no remaining natural teeth believe that they no longer need to make regular visits to the dentist. They believe that long as their dentures fit and they are able to eat and speak, dental visits are unnecessary. This is simply not true. The stability and comfort of dentures depends upon the bones and gum that support them. The longer dentures are worn, the greater the chance that they will fit poorly due to hard and soft tissue changes. These changes are difficult for patients to notice. Regular dental visits are an important element of keeping your mouth healthy and your dentures in good shape. Researchers from the University of Michigan School of Dentistry examined links between long-term tooth loss and frequency of routine dental visits in adults. The study concluded that individual risk factors help to determine the recommended frequency of cleanings needed per year to help prevent periodontal disease. The main point of this from the patients’ perspective is that personalized and routine oral care is a necessity for good dental health and your dentist can help you determine how many visits per year are appropriate for you. Contact us today on (02) 4954 6888 or request your appointment online.